Want to really impress your little Easter bunnies this year? Or perhaps you have an entire family who would appreciate a bountiful basket of Springtime treats? 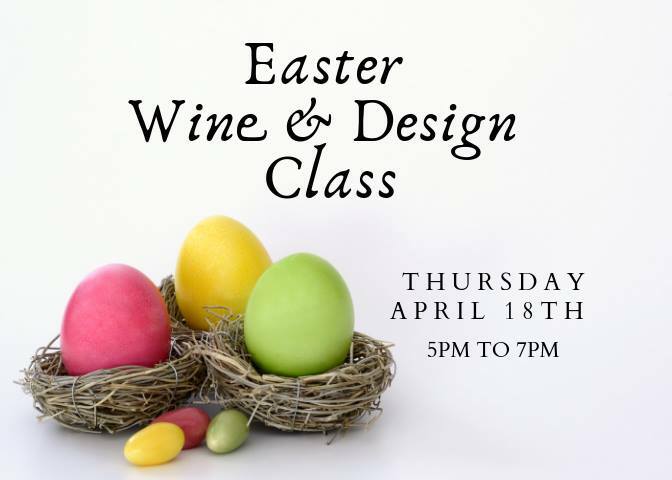 Join us on Thursday April 18th from 5:00-7:00pm for an evening of crafting and wine as we reveal our top-secret tips for designing beautiful Easter baskets! A limited number of seats are available for this hands-on class, in the comfort of our cozy, open-air showroom in Old Town Goleta. Your ticket price includes the basket and materials to wrap the gift, a glass of wine, and two hours of entertaining instruction. To fill your Easter basket, you can shop our shelves full of local gourmet goodies, craft beers and local wines, and you are welcome to bring in a few of your own items to add an even more personal touch. Suggestions include: Gift Cards, Framed Photos, Handmade Treats or Artwork, and of course, cuddly plush Easter friends and your recipients favorite Easter candy. At the end of the class you will have an impressive handmade Easter basket to take home to your recipient, or we can arrange delivery or nationwide shipping.